Armour to protect the elbows (couters) was taken up some time later than knee armour (poleyns) was, to judge by the effigies, though L & F Funken1 suggest around 1300 for both. Effigies begin to show couters after 1300, such as the 1320 brass of Sir William FitzRalph2. (Compare this with the 1277 effigy of Sir John D'Abernoun). Sir William's strongly suggest cuir bouilli construction, especially with the detailed tooling of the poleyns. A later D'Abernoun, Sir John D'Aubernoun Jr3, 1327, shows the use of both couters and roundels attached with points. Roundels are now used to provide extra protection for the armpit and/or the shoulder joint and the inner elbow. Shoulder roundels are commonly called Besagaws. 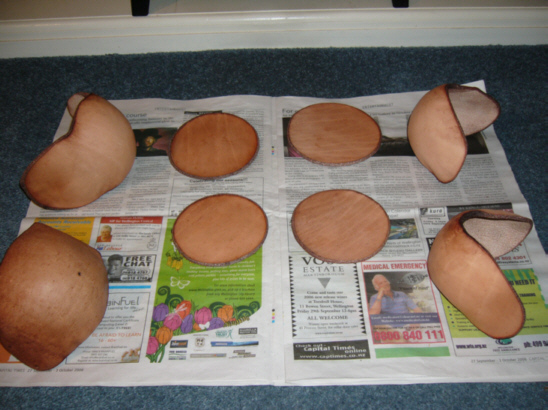 Pictured from left: poleyns, elbow roundels, shoulder roundels, and couters laid out for drying. Note that the curvature is more consistent for the couters than for the poleyns which had been made first. Close-up view of couters from the top. Close-up view of couters from the front. Although the curvature around the elbow is good, you can see that the curvature vertically differs. Close-up view of couters from the top. This view shows why the vertical curvature differs - note the greater dishing of the right-hand couter. Close-up view of couters from the bottom. Here the effect of the differing curvature results in a narrowing at the base. As a result the right-hand couter is used on the left elbow as potential restrictions in movement are not so important to a right-hander. The roundels and couters were drilled to take points and attached to gambeson. Correct placement of the couters was exceptionally difficult as was doing this by myself4. Remove gambeson and place temporary points (shoelaces) on gambeson with safety pins, the tie couters in place. 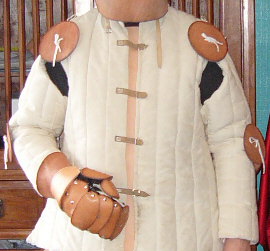 Put on gambeson, bend arms and look for gaps in protection, undo points and re-mark position. Repeat from #2 until correct. Lace shoulder roundels onto points and tie off. (The same process for positioning roundels was used as for the couters, but this was much easier as the roundel simply has to protect the armpit when arm is raised). Once assembled the couters and roundels give excellent protection and are so lightweight that you hardly know they are there. However, as noted in the Leg Armour article, the inability to shape cuir bouilli as precisely as steel explains why poleyns and couters were the first pieces of plate armour to be used nearly universally. 2 "Kelly's Brass" is the only reference I have ï¿½ image scanned from a book which is in storage. Will update this when I locate it. 4 I later re-did the job with assistance, but the result wasn't any better as it is the feel of the couter from within the gambeson, not it's apparently correct positioning from the outside which counts. 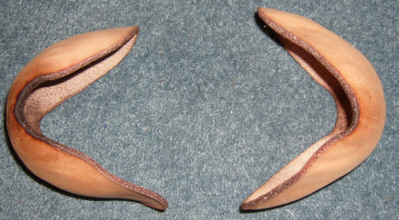 5 Finger-woven silk points with brass aiglets at the ends. Note: silk is very slippery for points and they tend to undo themselves. I solved this by dripping melted beeswax onto the areas which need to grip, removing excess with fingers once the wax hardened, and then tying them off.